See the Christmas tree in Trafalgar Square and the Christmas lights in Oxford Street, Regent Street and Bond Street in Mayfair. See the Christmas windows in Harrods, one of the most famous department stores in the world. This wonderful Christmas tour will really get you in the Christmas spirit. 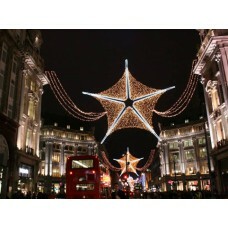 As we approach the festive season London transforms itself with Christmas lights and windows that are unrivalled. Your London Cabby Guide will collect you from your preferred pickup location, in the comfort of your Black London Cab will show you the very best that London has to offer! We commence with iconic Harrods whose windows are renowned the world over, passing by Kensington Palace on our way to see Winter Wonderland at Hyde Park and then Marylebone High Street. We travel next to Oxford Street where the shops all have a Christmas theme, followed by Regent Street, who traditionally have their own Christmas show. Piccadilly Circus, Trafalgar Square where Norway donates the tree every year. The Ritz and Buckingham Palace. Details of the exact tour may vary as London Christmas Lights are switched on at different dates. However, the main London lights are in place by 16th November. The Christmas Tree in Trafalgar Square is in place during the first week of December. Winter Wonderland 2017 is usually in November.